ok to level with (built-in) rear jacks, for winterizing? Please see the email from the former owner of my trailer. I am not yet equipped with jacks or blocks so, if safe and ok, I would plan to use this method. Does it seem ok? "I followed the suggestions in the owners' manual and jacked up the Scamp and reduced tire pressure to about half the normal 50 pounds. I spoke with the factory about using the rear jacks and the front hitch jack to raise the trailer enough to reduce weight on the axle and they approved the idea. First, I lowered the front jack part-way below level. Next I extended the rear jacks so they touched the ground (or were at their maximum extension). Lastly, I used the front jack to raise the trailer enough so that most of the weight was off the axle but left enough weight so that the wheels could not be easily rotated. You'll have to experiment a bit with how far to initially lower the front jack so that when you finally raise it with the rear jacks extended, you get the desired reduced weight on the axle. Depending on where you're storing the trailer you may have to put blocks under the rear jacks (or front jack) in order to get adequate height to reduce the weight on the axle sufficiently." What does the owner's manual suggest? If the same then you should be okay. A similar discussion came up on another forum, but relating to raising the wheels off the ground to change a tire by using the tongue jack and rear stabilizers. MY opinion, and this is my opinion based on experience with other vehicles, that doing so is not a good idea as it places load or stress on the frame and body that is not the norm. Rather than the weight being on the wheels & axle, you now put it all on the extreme ends of the frame which could possibly flex or bow the frame. Years ago a coworker had his Dodge Dart on bumper jacks with the wheels off and someone opened a door taking away some of the body strength and it actually distorted the door opening slightly so now the door didn't close properly. If I wanted to store a trailer or car with the wheels off the ground, I would support it as close to the normal load points as possible. Azer as others have mentioned you an can use pieces of wood to block up your trailer if need be. 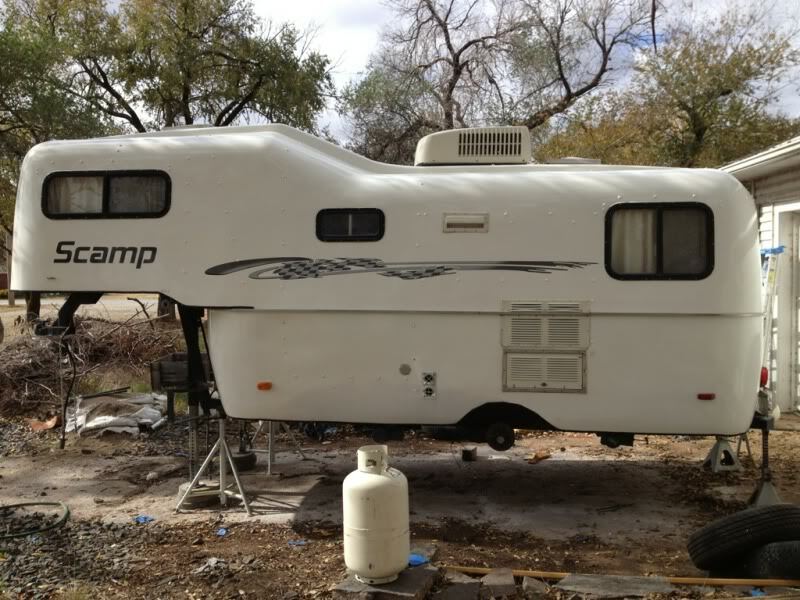 I know the rear jacks on my Scamp are not very strong so there is no way I would use them to jack up the trailer - in fact the Scamps Owners manual clearly states they are not to be used for jacking up the trailer. Scamp has the Owners manual online both in video format or you can down load the full manual in PDF form. The section you want to watch or read is titled wheels and bearings. Not to mention that the rear stabilizer jacks are not going to be nearly long enough to actually do what you want to do without using some sort of blocks under them. I spoke with the factory about using the rear jacks and the front hitch jack to raise the trailer enough to reduce weight on the axle and they approved the idea. Lastly, I used the front jack to raise the trailer enough so that most of the weight was off the axle but left enough weight so that the wheels could not be easily rotated. You'll have to experiment a bit with how far to initially lower the front jack so that when you finally raise it with the rear jacks extended, you get the desired reduced weight on the axle. The way I read this is that the trailer still has some support from the tires and axle, it is just less support there than if it were setting totally on the axle. The point of this exercise is winter storage while un-stressing the axle and tires somewhat for longer rubber life... and not to totally raise the trailer off the ground. Did I read it correctly? If so then I think that may be OK.
that is the way I interpret those instructions, to relieve some of the weight, but not all of it!! This is a wonderful opportunity to ascertain the effect of length on deflection and possible failure in a load-carrying beam (the frame). I'm happy I won't be conducting it! Sears sometimes has on sale a small floor jack that comes with a set of jack stands. I have three of those jacks, they're nice for when I don't want to drag around one of my big jacks. I used jackstands on the frame next to the tires. I raised the trailer about 3 inches. The low side tire rotates and the high side tire does not. Blocked the wheels and left all the stabilizers down. Seems OK.
Good grief. The frame isn't going to pretzel. Get some jack stands to set under it and move on. You can go partway between the rear bumper and axle if you want. The frame isn't going to pretzel. Please show documentation where scamp says not to. My manual recommends it be put up on stands to take some weight off the axle while it sits. It does not say where to put them. I'm pretty sure if putting the stands at the back of the camper would taco it, scamp would say so. Please show documentation where scamp says not to. My manual recommends it be put up on stands to take some weight off the axle while it sits. It does not say where to put them. . It should be jacked up on the beams not the bumper. I dont believe the bumper is designed to hold the weight of the trailer. Page 11 of my manual reads "Jacking up the trailer: On the trailer there are two min beams made out of 3 inch by 1 ½ inch tubing, one on each side. Either of these can be used as a point to jack up the trailer. Jack should be placed close to the axle or toward the rear of the trailer, so that the whole weight of the trailer is not on one point. WARNING: The rear bumper jacks are not intended to be used as a jack for changing tires. A scissor jack, hydraulic jack, or a floor jack should be used. "" Go to the Scamp website manual. Click on Wheels and bearings for a video of correct jack placement.